Dental implants are used to replace missing teeth and support a dental crown, dental bridge or even a partial denture. Implant dentistry has experienced remarkable growth in popularity recently due to the benefits dental implants offer and the growing awareness of the public. Arlington cosmetic dentist, Dr. Stephen Ratcliff, has restored numerous successful tooth implants over the years and has come to be respected in his field and known as a great dentist and coordinator of implant dentistry. If it has not already been done, the original, or natural, tooth root must be removed. This is needed to provide the space for a tooth implant to be placed. Next, the tooth implant is actually placed. The implant is situated in the same spot the original tooth root was located. We allow 3-6 months for the implant to completely heal. During this healing period the tooth implant undergoes a process called “osseointegration” with your jaw bone. The high-quality titanium alloy dental implants we use actually “fuse” with your bone and become exceedingly strong and provide a wonderful foundation for a crown, bridge or denture. After the healing period, an abutment is attached to the dental implant for the crown, bridge or denture to be directly attached. Dental Implant video showing how a dental implant is placed and how a crown can be bonded to the dental implant after the dental implant procedure. 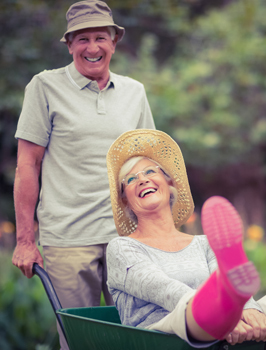 FUNCTIONAL | Once your dental implant is healed and placed, you may often forget it is not your natural tooth because you can eat, chew, laugh and smile just like normal. BEAUTIFUL | Dental Implant dentist, Dr. Stephen Ratcliff, places incredibly natural looking crowns, bridges and dentures that replicate the beautiful translucency and pearlesque appearance of natural teeth. DURABLE | Well-made and placed tooth implants are exceedingly strong and can stand up to a lifetime of use and abuse. They are often stronger than natural tooth roots. You can just think of dental implants as providing you with a “super smile”. If you have any questions about tooth implant dentistry or if you’d like to schedule an appointment at our Arlington, TX, office, call today! We proudly serve patients all over the area, including Grand Prairie!